We are looking forward to the next big character release in Marvel Future Fight. If you have been playing the game, you’ll know that developers Netmarble delivered a great update last month, with the arrival of the Guardians of the Glaxy and Dimension Shifters. Now, attention has shifted to the next Marvel Future Fight hero and we have had a tease from the developer on what to expect. When we saw that we immediately thought of Ant-Man, since this is a hero who is highly intelligent and very talkative. There’s also the little fact of the Ant-Man movie which is scheduled for release on July 17, 2015. Don’t forget that Netmarble has taken inspiration from Avengers 2 with the Future Fight storyline, while many of the characters in the game look like their MCU counterparts too – Tom Hiddleston’s Loki as one example, so Netmarble has obviously based his appearance in the game from the actor. With that in mind, it makes perfect sense that Ant-Man is the next character to arrive as Netmarble are probably under direction from Marvel to continue on with the MCU theme as we’ve seen from the Guardians of the Galaxy update. Otherwise, we welcome you to give us suggestions below on what other characters it could be who have great communication skills. Give us your thoughts on this and we’ll let you know once we have more details to share. 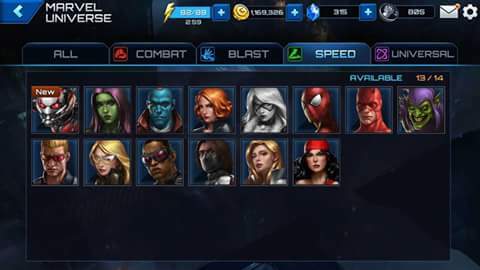 Update: An alleged image of Ant-Man has apparently leaked, revealing the character as a speed type. What do you think, could it be real? Answers coming soon.